Some plays are so mystical and rich with meaning that I feel inadequate. I know I should be getting more from the plot, from the language, from gestures, from everything. I am not worthy to be viewing the performance and should only be allowed back in the theater after completing a refresher course of Symbolism 201. Either that, or the play itself actually is thin, obvious, and over hyped. My ego makes me choose the later reason for my reaction to The River Bride. Ensemble from “The River Bride”. Photo by OSF. The story is set in an isolated Central Amazon fishing village and the story brings to life a fable concerning love and dolphin men. I wanted a character to root for, but I could not settle on the too good/prissy daughter, and the younger vixen was not a reasonable alternative. Mom and Dad were too flat and simultaneously opaque. The acting was excellent throughout, but there was a feeling of mystical “woo-woo”ism in too many of the scenes. The characters floated, even in action scenes. My mind drifted. If we were in the central Amazon area, should the characters be Hispanic/Latino or more indigenous? 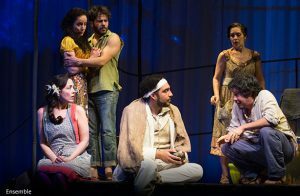 OSF is color blind in its casting of traditional shows, but they make an effort to do ethnic casting when the focus is on non-white experiences. But, are the people in the interior of the Amazon really Portuguese-speaking Hispanics? Probably I should trust the playwright who names the characters Moises, Senhor, Senhora. I am just ignorant. Oh, wait. What’s been going on the stage for the past five minutes? This entry was posted in osf, plays and tagged mystical, OSF, plays. Bookmark the permalink.